'Everything You Can Imagine is Real' - Pablo Picasso. And as war rages across Europe, David is violently propelled into a land that is both a construct of his imagination yet frighteningly real, a strange reflection of his own world composed of myths and stories, populated by wolves and worse-than-wolves, and ruled over by a faded king who keeps his secrets in a legendary book . . . NOTE: This is my copy (#122 of 125). It has a red goatskin leather spine with black cloth boards. There were colour options for both these parts. Declan Hughes read from his latest novel, as well as a section from the work-in-progress that is the third Ed Loy novel; John Connolly spoke about his love of books and No Alibis bookstore; music was provided by local groups Cat Malojian and The Winding Stair. The evening also saw the launch of the first book from No Alibis' publishing arm, EDEL TORR EDITIONS, a 125-copy limited edition of John Connolly's THE BOOK OF LOST THINGS. 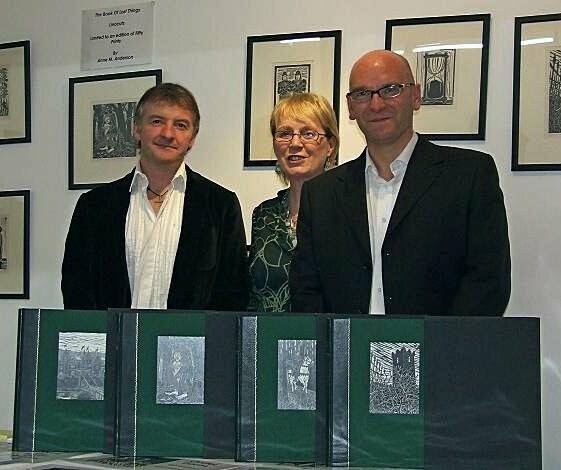 John Connolly, Anne M. Anderson and David Torrans with 4 copies of Edel Torr Editions' The Book of Lost Things. Edel Torr Editions Limited Edition HB (#122* of 125) (signed by the author, illustrator, binder and publisher). My version is unique in that it has a red goatskin leather spine, with black cloth boards, and 'Castle with Thorns' front cover artwork.